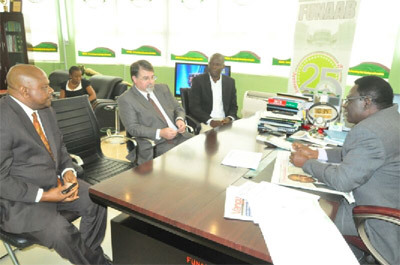 Two officials of the Embassy of the United States of America in the United States Department of Agriculture (USDA), Mr Russ Nicely, Regional Agricultural Counselor and Mr. Uche Nzeka, Agricultural Marketing Specialist, paid a courtesy call on the Vice Chancellor, Prof. Olusola Oyewole, in his office during the week. Mr Russ Nicely informed the Vice Chancellor about the existing opportunities for collaboration in the areas of value addition to cassava tubers, employment generation, research and development, student and staff exchange programmes and others. The Vice Chancellor appreciated them for the visit, as he looked forward to further developments on the issues raised by the guests, who came with Dr. Akeem Oyekanmi, Director, Centre for Internationalization and Partnership (CENIP).